"What an Excellent Service These Guys Provide for Their Customers"
"What an excellent service these guys provide for their customers. I took my car there for a clutch problem and they did a full check on the car and found out that the dealership had a recall about my problem. They took nothing from me and the car checkup was for free. Would take my car there again." "Tri City is a Reputable and Great Car Repair Company"
"Tri City is a reputable and great car repair company. I've referred my co-workers and friends to their shop and trust their word." "YES!!! Finally, I Found a Shop that Lives Up To the Customer Service and Knowledge that One Should Expect"
"YES!!! Finally, I found a shop that lives up to the customer service and knowledge that one should expect. I should have written this long ago but now that I am taking all the family’s cars there I have been more than happy with them. Taking my wife's car into the dealer this week (for warranty work only) just made me realize how much more how attentive and "on top of it" Tri-City is. I always get the update calls they promised and even if I called they had answers unlike the other places I have gone where I feel like a number instead of a valued customer." "Great customer service. Walked me through the entire process to make sure I was on the same page as them and satisfied. Would recommend to anyone." "The Drive is Well Worth It"
"To say that my wife loves her 1997 Ford Ranger is an understatement. The file folder is filled with repair invoices which also reflects our search for a competent and fair repair shop. We have found it with Tri-City! They quickly repaired a problem with the transmission and now it runs great! So, I brought the truck back to repair a leaky brake cylinder and worn motor mounts. I could set up with Ray Tansley a surprise for my wife of a new windshield. She picked up the truck and not only did the repairs make the truck run like new but the interior was cleaned up showing their dedication to customer satisfaction. Ray was a joy to work with giving me timely updates and setting up the windshield replacement. 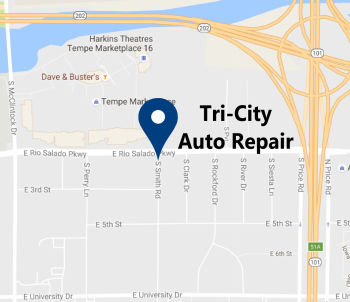 Although we live over 30 miles away Tri-City is our go to repair shop. The drive is well worth it to know that your vehicle is being tended to by old fashioned focus on having the customer feel like the problem has been fixed at a fair price. I recommend them to all my friends and coworkers with confidence that they will receive the same care as we did. Thank You, Dave, & Tri-City!" "Clean, Very Professional and Knowledgeable Operation!" "After having listened to Dave Riccio on the Bumper to Bumper show most Saturdays, I noticed that Tri-City was just down the street from my new office. As I am leaving town tomorrow was concerned about a couple of items on my car. I came in without an appointment and Dave himself drove my car and checked under the hood to provide an assessment of my concerns and advise if it was reasonable for me to drive my car up north this weekend. He spent about 45 minutes with me at no charge. Clean, very professional and knowledgeable operation, which I now plan to use for all my car maintenance needs!" "I Will Bring My Car and Truck Back Here for Any of my Automotive Needs"
"Dave and the entire staff at Tri-City Auto Repair were nothing but professional, courteous, and customer oriented. The mechanics are very knowledgeable and were able to fix my car with a simple, inexpensive solution instead of a $600 replacement part. The shop respected my time and returned my car promptly and we're mindful of my needs. I can truly tell that Tri-City wants to keep customers coming back for a long time. I will bring my car and truck back here for any of my automotive needs."